AISI P20 mold steel, plastic materials are widely used in plastic die molding. In this article, AISI P20 mold steel was drilled by using uncoated HSS twist drills. Holes were drilled by using Ø8 mm drill bit, three cutting speed (v:10, 13 and 17 m/min) and three feed rate (f: 0.1, 0.2 and 0.3 mm/rev) parameters, and woodpecker drilling method. Taguchi L9 model has been used in the drilling tests. Cutting forces and torque were measured during the experiments by a dynamometer. The surface roughness and diameter of drilled holes have been checked. Taguchi and ANOVA analyses were done to determine effects of cutting parameters on the experimental results. Grey Relation Analysis (GRA) was used to determine the effective of cutting parameters that were optimized results of the tests. The results showed that the federate in the cutting parameters was the main effective factor. Moreover, the heights cutting speed (17 m/min) and the lowest federate (0.1 mm/rev) pointed out optimum cutting parameters to optimize the test results. TMMOB, “Plastic materials and Technologies” Symposium, Ankara, 16-20, (1999). Songmene, V., “Machinability Testing of Mold Steels”, Industrial Research, 12-17, (1999). Plastik Teknolojisi Makine Enjeksiyon Kalıpçılığı-2, MEGEP, 24-30, 2008. Thompson, Handbook of mould, tool and die repair welding, first ed., Abington Publishing Limited, London, 224, (1999). M.Vedani, “Microstructural evolution of tool steels after Nd-YAGlaser repair welding,” J. Mater. Sci., Milan (39), 241–249, (2004). Wilson, P., ve Carlos, E., “Repair welding of polymer injection molds manufactured in AISI P20 and VP50IM steels.”, Journal of Materials Processing Technology (179), 244–250, (2006). Rech, J., “A new approach for the characterization of machinability application to steels for plastic injection molds.”, Journal of Materials Processing Technology (152), 66–70, (2004). Calvez, Le, C., “Gains Achieved by Using New Generations of Plastic Injection Mold Steels.” Industeel-Arcelor, 4-7, (2001). Ateş, S., “P20 Çeliğinin CBN Kesicilerle Frezelenmesi Sırasında Asınma ve Yüzey Pürüzlülüğüne ilerleme Değerinin Etkisi.”, Research & Development, 5-8, (2009). Luis, A. ve Helleno Schützer, K., “Investigation of tool path interpolation on the manufacturing of die and molds with HSC technology.”, Journal of Materials Processing Technology (179), 178–184, (2006). Fallböhmer, B., ve Rodriguez, A., “High-speed machining of cast iron and alloy steels for die and mold manufacturing.”, Journal of Materials Processing Technology (98), 104-115, (2000). Hossein, A. ve Kadirgama, K., “Prediction of cutting force in end-milling operation of modified AISI P20 tool steel.”, 2. Ulusal Tasarım İmalat ve Analiz Kongresi., 4-8, (2010). Köse, S., AISI/SAE 1040-2738-304 “Çeliklerin Sertlesme Kabiliyetlerinin Jominy Deneyi ile Araştırılması.” Yüksek Lisans Tezi, Afyon Kocatepe Üniversitesi Fen Bilimleri Enstitüsü, Afyon, (2008). Köse, S., Said, G., Günes, Erdogan, M., “The Investigation of the hardening ability of AISI 1040 – 2738 Steels with Jominy Test, (IMSP’ 2008) 12th International Materials Symposium, 64-72, Denizli, Turkey, (2008). Kiyak, M., ve Çakir, O., “Examination of machining parameters on surface roughness in EDM of tool steel.” Journal of Materials Processing Technology (191), 141–144, (2007). Sakarya, N., ve Göloğlu, C., “Taguchi yöntemi ile Cep İşlemede Kullanılan Takım Yolu Hareketlerinin ve Kesme Parametrelerinin Yüzey Pürüzlülüğüne Etkilerinin Belirlenmesi.” Gazi Üniv. Müh. Mim. Fak. Der. Cilt 21, 603-611, (2005). Çelikçapa, F. O., “Taguchi Deneysel Tasarım Metodunun Bir Dokuma İşletmesinde Uygulama Denemesi”, Uludağ Üniversitesi Dergisi, (2002). Antony, J., “Simultaneous Optimisation of Multiple Quality Characteristics in Manufacturing Processes Using Taguchi’s Loss Function”, Int. J. of Adv. Manuf. Technology, 17:134-138, (2001). El Tammimi A., Darwish S. M., “Geometric accuries of NC and conventionally drilled holes”, Journal of Materials Processing Technology 111-116, (1998). Sadasia R.T., Rajesh V., VenuGopal A., “Taguchi based Grey Relational Analysis to Optimize Face Milling Process with Mıltiple Performance Characteristics”, International Conferance on Trends in Industrial and Mechanical Engineering (ICITIME’2012), Dubai, (2012). Haq AN, Marimuthu P, Jeyapaul R. “Multi response optimization of machining parameters of drilling Al/SiC metal matrix composite using grey relational analysis in the Taguchi method”, International Journal of Advanced Manufacturing Technology;37:250-5, (2008). Palanikumar K. “Experimental investigation and optimisation in drilling of GFRP composites”, Measurement: Journal of the International Measurement Confederation, 44:2138-48, (2011). Ay M., Çaydaş U. and Hasçalık A., “Optimization of micro-EDM drilling of inconal 718”, International Journal of Advanced Manufacturing Technology, 66:1015-1023, (2013). Tosun G. “Statistical analysis of process parameters in drilling of AL/SIC P metal matrix composite”, International Journal of Advanced Manufacturing Technology, 55:477-85, (2011). Rajmohan T, Palanikumar K. “Optimization of machining parameters for multi-performance characteristics in drilling hybrid metal matrix composites”, Journal of Composite Materials, 46:8, 69-78, (2012). Balasubramanian S., “Grey Relationa Analysis to determine optimum process parameters for Wire Electro Discharge Machining (WEDM), International Journal of Engineering Science and Technology (IJEST), Vol 3.No 1. (2011). Sarıkaya M. and Güllü A., Multi-response optimization of minimum quantity lubrication parameters using Taguchi-based grey relational analysis in turning of difficult-to-cut alloy Haynes 25” Journal of Cleaner Production 91, 347-357, (2015). ISNAD KAYIR, Yunus , SÜZGÜNOL, Mehmet . "OPTIMIZATION OF CUTTING PARAMETERS FOR DRILLING AISI P20 DIE MOLD ALLOY STEEL WITH TAGUCHI AND GRA METHODS". 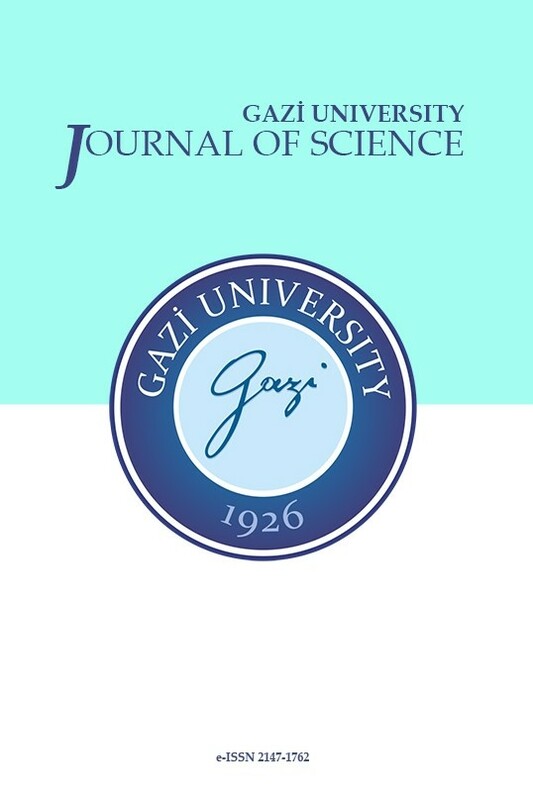 GAZI UNIVERSITY JOURNAL OF SCIENCE 31 / 3 (September 2018): 898-910.